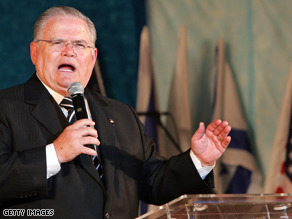 Pastor John Hagee endorsed McCain earlier this year. (CNN) - In the face of mounting controversy over headline-grabbing statements from Pastor John Hagee, CNN has learned presumptive Republican nominee John McCain has decided to reject his endorsement. The Huffington Post had published a recording of Hagee saying that Adolf Hitler had been fulfilling God’s will by hastening the desire of Jews to return to Israel in accordance with biblical prophecy. “Obviously, I find these remarks and others deeply offensive and indefensible, and I repudiate them. I did not know of them before Reverend Hagee's endorsement, and I feel I must reject his endorsement as well,” McCain said in a statement to CNN Thursday. He added that his relationship with Hagee did not compare with Obama’s lengthy association with Rev. Jeremiah Wright. “I have said I do not believe Senator Obama shares Reverend Wright's extreme views. But let me also be clear, Reverend Hagee was not and is not my pastor or spiritual advisor, and I did not attend his church for twenty years. I have denounced statements he made immediately upon learning of them, as I do again today,” said McCain. The Arizona senator had earlier renounced comments from Hagee that termed the Catholic church "the great whore" and "an apostate church." In a statement released before McCain rejected his endorsement, Hagee said his words had been taken out of context. "The intentional mischaracterization of my statements by an Internet journalist seeking to use me as a political football in the upcoming presidential race is a gross example of bias at its worst. I will not stand idly by while my character is assassinated and my views on the Holocaust are grossly distorted. "To assert that I in any way condone the Holocaust or that monster Adolf Hitler is the biggest and ugliest of lies. I have always condemned the horrors of the Holocaust in the strongest of terms." He also pointed to millions of dollars worth of donations his ministry had made to humanitarian efforts in Israel. McCain has faced similar pressure to distance himself from Minister Rod Parsley over the minister’s statement that Islam was “an antichrist religion that intends through violence to conquer the world.” A McCain aide downplayed the association, telling CNN Thursday that the senator had met Parsley only one time, over breakfast, and was not aware of the minister’s statements before accepting his endorsement. UPDATE: Citing critics who had been "grossly misrepresenting" his positions since his decision to back John McCain, Hagee withdrew that endorsement Thursday afternoon. "I am tired of these baseless attacks and fear that they have become a distraction in what should be a national debate about important issues. I have therefore decided to withdraw my endorsement of Senator McCain for President effective today, and to remove myself from any active role in the 2008 campaign," he said in a statement. "I hope that the Senator McCain will accept this withdrawal so that he may focus on the issues that are most important to America and the world." but, rev.wright was on 24/7.........!!!?? McCain really is the master of the flip-flop. His on-again off-again relationship with this shady pastor, shows us that John McCain is no longer the maverick he was in 2000. Now he is just a man who sold out his beliefs for a chance to become president. He blew it. What is with the McBush? Wow, it amazes me how mindless some democrat supporters can be...tote the party line much? I am glad I changed from democrat to independent. I was so proud to be a democrat until they didn't do what they promised when they took over Congress. Both parties are disgusting! McCain is no Bush, never will be and never has been. There must be a reason both the extreme left and right hate him...he doesn't tote a party line...hmmm. Just right for me. First time I will be voting republican will be in 2008. Also, Obama can give up VA now, looks like late term abortion issue will bring out the conservatives to vote against Warner. I think McCain has VA in the bag. He was Glad to have it a few weeks ago. After he had opportunity to vet him. He's worried about Jewish votes in Florida. No big deal, Hagee is not a black preacher with dangerous clothes and funny music. There's nothing to be afraid of. Nothing in Obama's history or policy looks anything like Wright's radical thinking but just because Hagee didn't baptize McCains children there's nothing to worry about. Only funny thing is his foreign policy and McCain's sound and look the same. Case in point, Iran. I bet if Rev. Wright would have mad the exact same comments as Pastor Hagee, the media (especially Fox News) would be crucifying Obama for his link to such a "controversial" figure. Point being, I don't think Pastor Hagee should be that big of a Political issue. Nor should Jeremiah Wright. Lets stick to the real issues affecting America please-like why gas will hit $5.00/gallon in some parts of the country before summer's end; or why we are still fighting a pointless war. On one hand I am glad they are putting McCain under the microscope like they did Obama w/ the Wright thing; however, this really has nothing to do with his campaign just like Wright had nothing to do w/Obama's views. Everyone that we know and respect will not always share our views. And what about Rev. Parsley, Mr. McCain???? NEXT: Mrs. McCain's tax records, please. AND: We'll be paying more attention to those medical records now that you tried to bury them Memorial Day weekend and possible-VPs-visit weekend. AND: What was so important in Cali that you couldn't show up to vote AGAINST the GI Bill? Oh, it's good to see that the Repukes can't take their own medicine. But, nonetheless, morons will still see Rev Wright as an issue. It's sad. Its about freakin time someone brought this up! There are a lot of hypocrites in this nation. Because they haven't put out any video looping it over and over and over and over and over and over and over and over and over and over and over and over again until we think wow he's being offensive! I support Obama and feel the same way about this story as the Rev Wright story. I do not care about what other people say. I do not care about sound bites. I'm not going to bash McCain because it is wrong to do that. Two wrong does not made a right. I support Obama because of issues like the war,his tax plan, or his long term pan around gas prices and health care. I do not vote out of anger of just to call myslef a Dec or Rep. I do not vote for gender or race or age. I do research and then I vote. No, it does not compare to Obama's situation with Reverend Wright. The controversial statements made by wright were 1) done after Obama was already a member of the church, 2) When he was in Washington and unaware of them, 3) The comments were nowhere close to the level of hate by Hagee. I am a white person and the only thing i was offended by in wrights sermon was that Aids was a tool to kill Blacks in America. I believe that aids was a biological weapon developed by the US and was tested in Africa. The transferrance to the USA was unintended. The fact that our military and political leadership felt that Africans were no better than human lab rats with no value except to kill for our benefit is the true problem. Mr. McCain, You sought out the endorsement of this man after he had made these statements. So are you doing this for political reasons or are you just in incompetent leader? 5 seconds after i heard about you seeking Hagee's endorsement i was able to see enough by doing a google search to know that was a bad idea. Where were the great skills you supposedly have to lead this country at that time? All Aboard the Doubletalk Express! dear hillary supporter – "if hillary doesn't beat mccain you'll vote for mccain?" will you promise not to, if by some miracle it's obama vs. mccain?? and if not – say your good byes to roe v wade and all other women's and democratic issues– don't look now, but McC is betrothed to the evangelical base. Doesn't the U.S. Constitution give every citizen a right to vote? Like maybe MI and FL – 2 states out of Obama's 57 states. I am trully getting sick and tired of this type of reporting. No matter what happens in this campaign you seem to always have a but... for Obama. I keep hearing "Why can't Obama close this out?" The proper question is "Why is Clinton behind?" With all of her name recognition, money and power one would think that the campaign would have been a walkover for her. Michigan and Florida allowed their politicos to lead them down the wrong road and now they want to blame everyone else. They knew what they were doing and what the consequences would be but they did it anyway. They only have themselves to blame. Forgive me if I don't feel sorry for them. Florida, is just a bad joke, with all the shenanigans that they have been involved in. Regarding McCain and his pastors who he CHOSE to accept their endorsements. I guess you will run that today and maybe tomorrow but that will be it. How shallow has your reporting become. I was almost going to say that you sholud be ashamed of your reporting, but I forgot you have to have a standards to measure by, which you seem to be loosing rapidly. This doesn't matter either....and to the HRC idiots who believe that Rev. Wright spoke angrily against racism and the issues that were PROVEN by YOUR VOTES in West Virginia and Kentucky (they proved Rev. Wright to be RIGHT)....If you believe that he spoke like that for 22 years, then please explain why Sean Hannity went through SIX YEARS of DVDs and was only able to come up with 6 minutes of loud footage by Rev. Wright from TWO sermons. If it was 22 years, then there should be much much more to show. Try thinking on your own for a second. When you see clips from a new movie and the only show the same scenes over and again...everyone knows that is because those are the only good scenes in the movie. The only reason why MC Cain took Hagee of the table is because then it leaves Wright on the table. Because Hagee WAS NOT Mc Cain's pastor nor did Mc Can attend his church so he would have no idea what the guy says. Obama has a church problem not a Rev Wright problem, Rev Moss is just as bad, it that church it's Black Liberation theology that Obama has a problem with, that will bite him in the a– in Nov. I can see McCain's point that it's not quite the same situation as with Obama and Jerimiah Wright, since Obama had a much longer relationship with his pastor, but to me it still calls into question McCain's judgement. After all, McCain actively sought Hagee's endorsement. Why would he seek the endorsement of a person like this? At least some of Hagee's comments were well known at the time of endoresement. Also, this didn't even get a fraction of the media play that Obama's pastor did. Maybe there is something to the rumors that the media loves and protects McCain?? Come Mccain ,admitt it you're ,GAY not that theres anything wrong with it . Just fess up. we understand all those lonely nights in beautyful downtown Hanoi with all those young sweaty mens come on grandpa tell us a story !!!!! I bet if Rev. Wright would have made the exact same comments as Pastor Hagee, the media (especially Fox News) would be crucifying Obama for his link to such a "controversial" figure. Well McBush...what about Rod Parsley??? you called him one of the greatest world leader and spiritual guide...and you seeked and got his endorsement. He wants to Obliterate Islam. Are you going to denounce and repudiate him??? We are our own worst enemy. I'm voting for Obama because he'll buy me a pony when he becomes president.